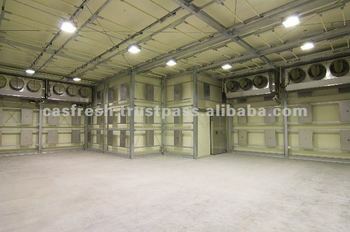 System provides stable internal temperature and prevent oxidation of products. Installation space can be chosen freely. Harmonic Oscillating System maintain the fresh quality of products for a longer Pperiod of 1 to 2 years without deterioration or oxidation. This is due to the temperature control function which operats when room temperature rises by defrosting or door opening. Heat will immediately be absorbed to bring down the chamber temperature to setup temperature in a short time. On-site set up is possible. For improvement, this specification might be changed without notice.